Consultation – Transforming Legal Aid, or as We Like to Call It, Destroying Legal Aid…. 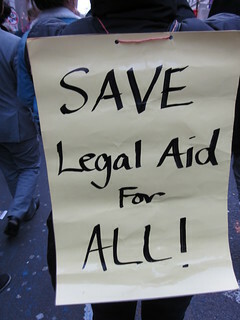 Perhaps one of the most important consultations to date, affecting not only solicitors, barristers and service providers but also families, the Transforming Legal Aid Consultation aims to get everyone’s views on the proposals to alter the already negligible system of legal aid. This is one consultation everyone, we would humbly suggest, should engage with. The idea that the government will save the tax payer “£220 million per year by 2018/19” (with this interesting caveat – “This estimate takes account of the assumption that, as in recent years, fees will not be uprated by inflation over the four years to 2018/19. It should be noted that the figures in the accompanying Impact Assessments are long run steady state savings which take account of the continued impact of the policy proposals.“), is not only short-sighted (what will the cost be to society as a whole if the legal system is not given the chance to become more efficient and the law leaves thousands of people stranded every year?) but dangerous and clearly nothing more than a political playing card during difficult times. We’ve said it before – instead of cutting funds where they’re needed most, assess spending and re-adjust accordingly. A lot of government funds are wasted when they could be put to better use. Re arranging the way we spend public money would be far better in both the short and long term, rather than letting everything fall by the way side. A catastrophe. If you feel as strongly as we do about this Consultation, you can check out the blurb on it here and you can fill out the survey here. The Consultation runs from now until Tuesday 4th June at midnight and the government will respond to the Consultation in the Autumn of this year. Come on people, let’s make some noise.